Just fitted it so bit early to give a proper review, but Yuasa do good batteries so no trouble expected -and great service from Tanya. Excellent service. Quick delivery, you deserve the reputation you have built up. I know where where my next battery will come from. Really great quality leisure battery and fantastic price. Delivery was fast and good communication and tracking. Battery arrived on the day promised and was very well packaged and fully charged. Will buy again. 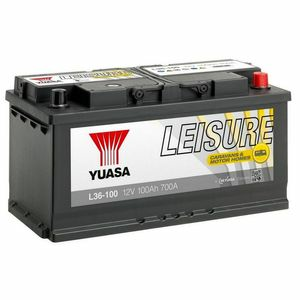 Good battery I always rate YUASA as use them in my control systems, I fitted this under Driver seat of VW T6 as it has a low height for a 100Ah. Delivered next day well packed great service.